Distribution and habitat: Zantedeschia species are a rhizomatous herbaceous perennial plants native to southern Africa growing naturally in swampy marshland, which tends to dry up during the summer months – a period of dormancy for the plants when they tend to dray off and lose their foliage. Zantedeschia elliottiana is known from horticultural sources only and is probably of hybrid origin. 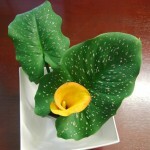 Description: Zantedeschia elliottiana is a stemless plant with large, unusually arrow-shaped leaves and showy flowers. The leaves are heavily white spotted dark green, up to 28cm (11 inch) long and 23cm (9 inch) wide with 60cm (24 inch) long stalks. 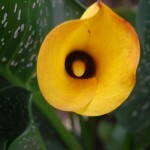 The inflorescence is a typical arum flower with the central erect spadix surrounded by a showy spathe. It is carried on a long stout stalk that rise among, sometimes above, the long leaf stalk. The 15cm (6 inch) long spathe is bright yellow inside and greenish yellow outside, forming an open trumpet around the yellow spadix. Flowering occurs in late spring and summer and they last over a month. The flower is occasionally followed by a spike of bright yellow berries that are attractive to birds. It has fleshy rhizomes that run just below the surface of the potting mixture and from which fleshy feeding roots grow down into the soil. 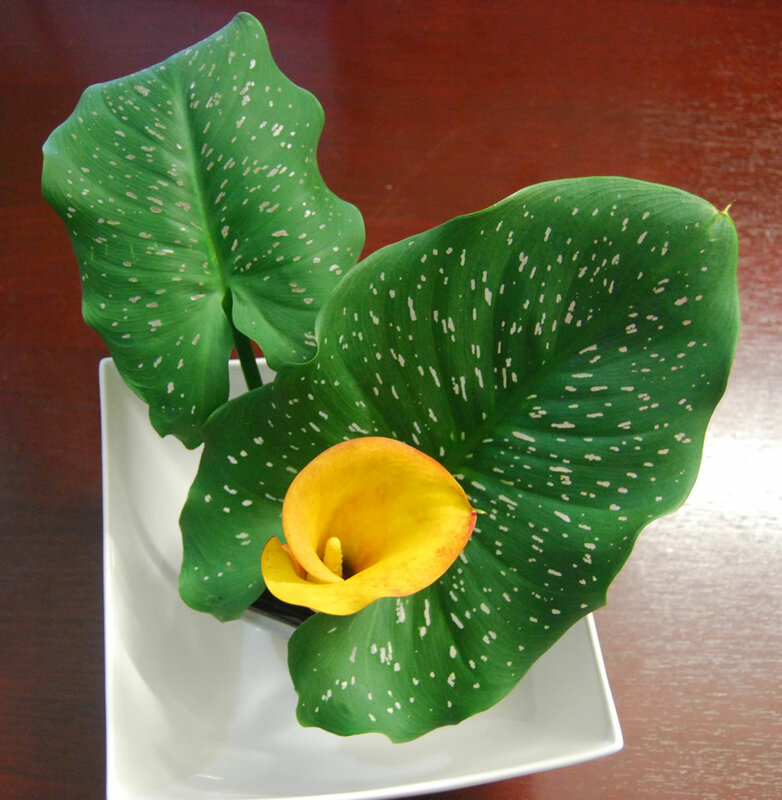 Houseplant care: The resting period should be followed with Zantedeschia elliottiana used as indoor plants; they can provide only a temporarily display. Dormant rhizomes, however, once given suitable conditions, can be brought into new growth and can flower for many years. Light: Provide bright light with some direct sunlight during the months when these plants have foliage. In the dormant period (usually from late spring to early autumn) keep the dried-out plants in a sunny spot in the garden or on an outdoor terrace or balcony – an ideal position as long as there is no risk of frost or very wet weather. Temperature: When Zantedeschia elliottiana are starting into growth (usually from early autumn onward), they should be kept cool – if possible, at a temperature of 10-13°C (50-55°F) for about three months; thereafter, about 18°C (64°F) is best for Zantedeschia elliottiana hybrid until flowering is under way. While they are flowering , keep the plants at normal room temperature; temperatures above 21°C (70°F) are likely to curtail the blooming period of flowers and make the leaves wither prematurely. For rhizomes which are dormant, temperature is not an important consideration. Watering: Water the newly potted plants or old rhizomes starting into growth after the dormant period sparingly – just enough to moisten the potting mixture throughout at each watering and allowing the top two-thirds of the potting mixture to dry out before watering again. 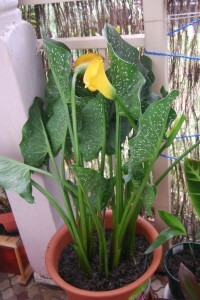 As growth develops, increase the quantity gradually until the Zantedeschia elliottiana are in full leaf. Thereafter, water the plants plentifully as often as is necessary to keep the potting mixture thoroughly moist; these are among the few plants that need constant moisture at their roots during the active growing period. When they are in full leaf, in fact, potted Zantedeschia elliottiana can stand in saucers of water. When the plant stops flowering, reduce the amount of water gradually and stop watering altogether when the leaves become yellow and withered. Leave the dried-out Zantedeschia elliottiana in their pots for the entire rest period, whether indoors or out. An occasional brief moistening from rain will not harm the dormant plants, but they must on no account be subjected to prolonged rainfall. Feeding : Once plants are in full leaf, apply a liquid fertiliser every two weeks and increase this to weekly dose when flowers appear, continuing until the end of flowering season. Potting and repotting: Use a soil based potting mixture. A single flowering-size plant can be accommodated in a 15cm (6 inch) pot, but larger slumps need either larger pots or small tubs. In the autumn, as plants start into growth, move them into pots one size larger, if necessary. When maximum convenient pot size has reached, divide up the plants for propagation. Dry, newly purchased rhizomes can be also planted at this time, either singly in 15cm (6 inch) pots or three together in a 20-22cm (8-9 inch) pot. Place the rhizomes horizontally with the eyes facing up in pots about 5cm (2 inch) below the surface of the potting mixture. Gardening: Zantedeschia elliottiana rhizomes can be planted in either the spring or fall in zones 9a-10. In other areas, they can be planted in the spring after daytime temperatures remain above 13°C (55°F). In areas where they are not hardy, dig the rhizomes in early fall, clean off excess soil, let dry out of the direct sun for a few days, and store them in vermiculite or dry peat moss in a cool 10-13°C (50-55°F), dry place. Leave the leaves to withered and dry out by themselves as they provide the nutrients to allow the rhizome grow and reproduce. Forming seed takes a lot of energy from the plant, so if not intended to propagate Zantedeschia elliottiana by seed, cut the dying flowers off. Location: Zantedeschia elliottiana should be planted in a location that gets full sun for most of the day, but some late afternoon shade, particularly in hot summer regions. Soil: Zantedeschia elliottiana grow best in a moist, well drained soil that has been enriched with compost and other organic matter. It can be grown as a marginal plant in water up to 30cm (12inch) deep. Use aquatic compost and a 30cm (12inch) deep planting basket. Prepare the planting hole by mixing in compost, peat moss and bone meal. Plant the tubers horizontally, 30cm (12 inch) apart, with the eyes facing up. Zantedeschia elliottiana rhizomes should be planted 5cm (2 inch) deep. After planting, water Zantedeschia elliottiana generously, soaking the soil. Irrigation: Zantedeschia elliottiana are bog plants, meaning they like a soggy soil or an almost constantly wet area to grow in. While it appreciates watering during the growing season it should be dried out once it has finished flowering in late summer to prepare it for its winter dormancy. Fertilise: Fertilize monthly with a good all-purpose fertilizer when actively growing. Keep well mulched to preserve soil moisture. Propagation: Divide rhizomes or detach the offsets that develop around the main rhizomes for propagation. Either process is best done at the time of repotting in the autumn when they are just starting into growth. Separate the rhizome into several pieces making sure that each piece has healthy growing point. Pot single sections or a divided rhizome in a 15cm (6 inch) pots of slightly moistened potting mixture and treat them as mature plants. Plant small offsets in 8 or 10cm (3-4 inch) pots until they are bigger enough to move into bigger containers, but otherwise give them exactly the same conditions as the larger rhizomes. It is also possible to increase Zantedeschia elliottiana number from seed. This is the easiest way to get a stock of the mixed hybrids, since they are less readily available as rhizomes than the other forms. Raising these plants from seed, however is a complicated, lengthy process which is best carried out in the carefully regulated conditions of a cool green house. It is definitely not an advisable procedure for most amateur growers. The seeds of Zantedeschia elliottiana should not be covered because they require light for germination. Sow seeds indoors in early spring and maintain a temperature in the moist growing medium of 21-24°C (70-75°F) during germination, which takes 30-35 days. The new plants will not flower for two or three years. 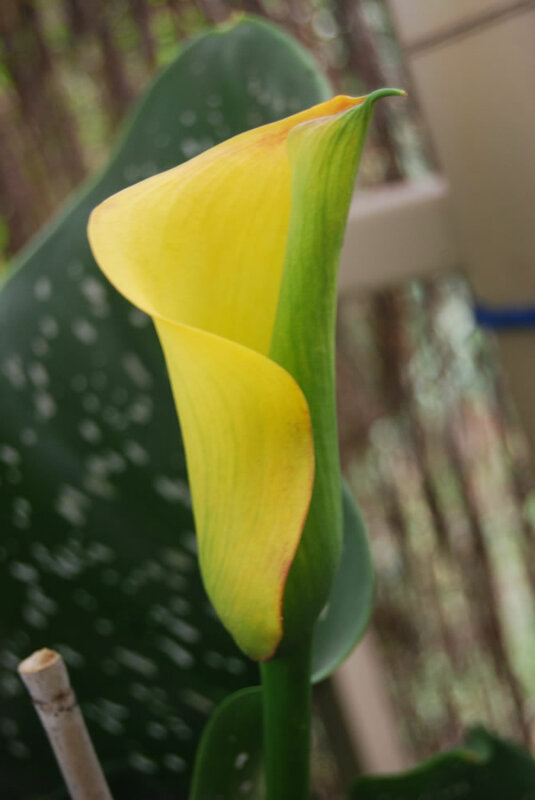 Problems: Zantedeschia elliottiana can suffer from cold damage, but are otherwise fairly trouble-free. Take precautions to protect Zantedeschia elliottiana from slugs and snails. Treatment: Use a snail & slugs bait. The worst disease Zantedeschia elliottiana get is soft rot with Erwinia bacteria. Erwinia is a common organism in the soil, but it will rush in and attack if the plant starts to get rot. These plants may rot because: they have been overwatered or they are overstressed due to their roots getting too hot. Treatment: Cut out rotted portions in rhizome. Dry thoroughly for a day or two then soak for an hour in a 2percent formaldehyde solution. Drain and plant immediately. Zantedeschia elliottiana is prone to rust on leaves, stems and spent flower debris. Rust often appears as small, bright orange, yellow, or brown pustules on the underside of leaves. If touched, it will leave a colored spot of spores on the finger. Caused by fungi and spread by splashing water or rain, rust is worse when weather is moist. Treatment: Provide maximum air circulation. Clean up all debris. Do not water from overhead and water only during the day so that plants will have enough time to dry before night. Apply a fungicide labeled for rust on affected plants. 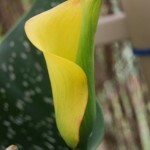 If Zantedeschia elliottiana do not flower, move them where they can get more sunlight. 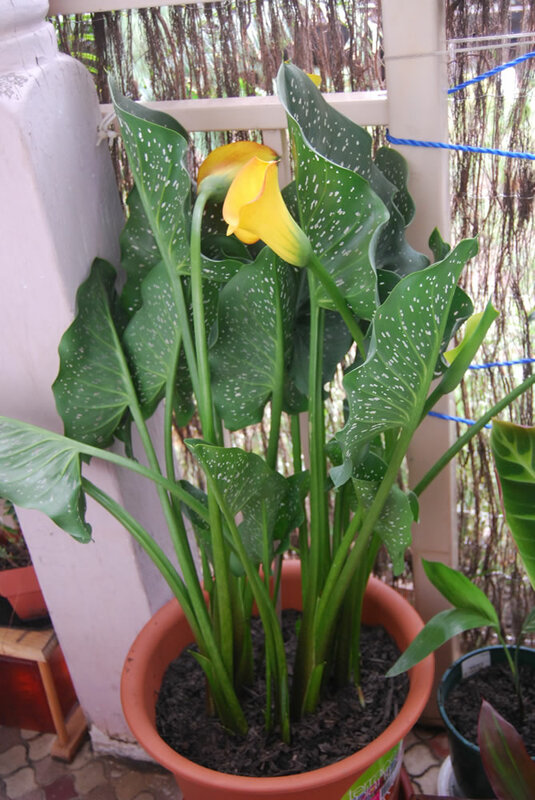 Availability: Zantedeschia elliottiana is available as potted plant in flowering period and as dried rhizomes in dormant period or even seed. Cut flowers are available in all seasons. 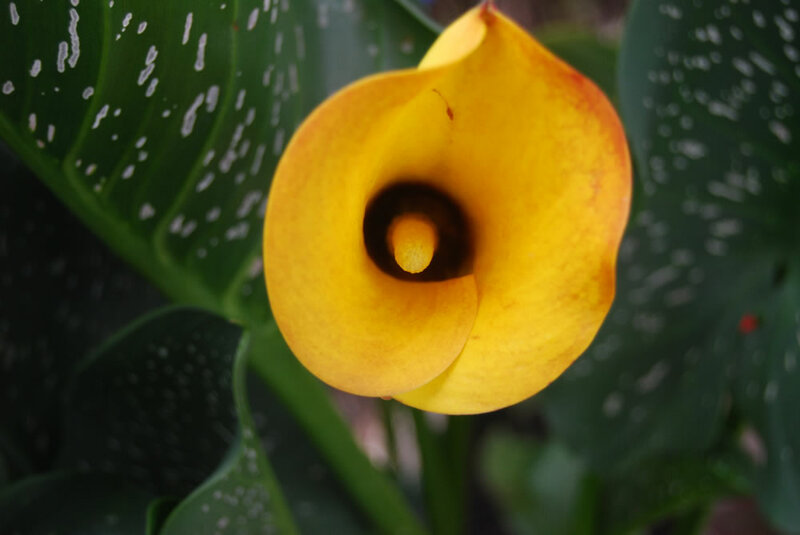 Toxicity: Zantedeschia species are poisonous due to the presence of calcium oxalate. All parts of the plant are poisonous, typically producing local irritation or a burning sensation in the mouth and occasionally vomiting and diarrhea. Uses and display: These tender varieties can be displayed either as houseplants or seasonal outdoor bedding displays. Zantedeschia elliottiana can be used as marginal plant in water garden. Zantedeschia elliottiana is used as extensive commercial production for cut flowers, being very popular and appreciated for bouquets as the beautiful flower last for over a month in vase.